Written for the 2011 Leper Creativity: Cyclonopedia Symposium. See also accompanying video The Invention of Negarestani. Freud, Ferenczi, Lovecraft, Bodkin, Challenger, Cane, Barker, Land, Parsani. Unilkely characters. Crackpots, every one of them. Frauds, fakes, pseudoscientists at best. Indisciplined thinkers breeding speculative mongrels. Hysteria, neuronics, stratoanalysis, schizoanalysis, geotraumatics. Through misinterpretations, imaginary convergences, forced coupings and other shady maneouvres lacking in the principled behaviour expected of a scholar, they claimed to have invented a new discipline referred to by various names at various times; but no-one clearly understood what the goals, methods or principles of this new discipline were. And yet, there was something important here; something on the verge of being forgotten. There would have been no trace, the Geo-cosmic Theory of Trauma would not even have been a memory, if it weren’t for the work of the Plutonics Committee. Not that it was easy. An indirect approach was necessary. A contemporary advocate, a new candidate. If he didn’t exist, he would have to be invented. And this time, something had to get through. The committee had its eye on the widest possible target market. So the primary task was an understanding of how ideas travel – an epidemiology of the concept. It obviously couldn’t be an academic. Things have changed: freaks like Land and Parsani wouldn’t even get through the doors of a university these days. No, it would have to be an outsider—exotic, even. Some peculiar maverick, self-taught, no qualifications; a lone voice who comes out of nowhere. He or she must be credibly unreachable, hidden away. Somewhere on the Axis of Evil, maybe, to add some political intrigue: A persecuted dissident scouring the outer reaches of the web to find other sick-minded individuals, he comes across Land, retired from philosophy and now promulgating conspiracy theory and peddling neo-occultist speculations. Land passes on the last Barker manuscript to him. Then he discovers Parsani’s notebooks in Iran, realizes the Bodkin-Cane connection, and begins to piece it together. It could have happened that way. Then move him to the Far East. Someplace no-one ever goes. Not even China or Japan – Malaysia. Construct his writings in a kind of tortured, gnomic style that combines extreme etymological acuity with a sick imagination that comes of watching too many horror movies. Anyhow, he’s probably sick in some way. Insomniac, delirious, unable to function normally; sick with some kind of middle-eastern fever. That could be the case. Invisible, his character must exude a sort of enigmatic charisma, and an aura of exoticism. Since he comes from outside, almost anything would be credible. Keep him hidden for as long as possible, unseen but effective. Personal appearances made and cancelled. Visa problems, poor health, whatever it takes. If it gets to the stage where he does have to appear, it has to be done well – no expense spared. But above all, the ideas keep coming, exerting a subterranean influence. All that is necessary is that he exist long enough to effectuate inception. Once the ideas take, once the ideas are embedded, he can easily be retired. Anything could happen to a freak like that. It’s true, the Committee took risks. Carried away with their creation, they ventured a few unnecessarily baroque twists. A fictional quantity expounding the theory of its own hyperstitional inexistence? A puppet who tells us what is pulling our strings? In the end, no-one would be crazy enough to believe it wasn’t true. Going up that river was like travelling back to the earliest beginnings of the world, when vegetation rioted on the earth and the big trees were kings. An empty stream, a great silence, an impenetrable forest. The air was warm, thick, heavy, sluggish … The long stretches of waterway ran on, deserted, into the gloom of overshadowed distances … We were wanderers on prehistoric earth, on an earth that wore the aspect of an unknown planet. – When were you born? So you’re one of the dreamers now. You’ve beheld the fata morgana of the terminal lagoon. You look tired. Was it a deep one? To begin with there is a nucleus consisting in memories of events or trains of thought in which the traumatic factor has culminated or the pathogenic idea has found its purest manifestation. Round this nucleus we find what is often an incredibly profuse amount of other mnemic material which has to be worked through in the analysis and which is, as we have said, arranged in a threefold order. [I]n Breuer’s analysis of Anna O, […] under each of [….] seven headings ten to over a hundred individual memories were collected in chronological series. It was as though we were examining a dossier that had been kept in good order. They make the work of analysis more difficult by the peculiarity that, in reproducing the memories, they reverse the order in which these originated. The freshest and newest experience in the file appears first, as an outer cover, and last of all comes the experience with which the series in fact began. Such groupings constitute ‘themes’. These themes exhibit a second kind of arrangement. Each of them is – I can not express it in any other way – stratified concentrically round the pathogenic nucleus. The contents of each particular stratum are characterized by an equal degree of resistance, and that degree increases in proportion as the strata are nearer to the nucleus. Thus there are zones within which there is all equal degree of modification of consciousness, and the different themes extend across these zones. The most peripheral strata contain the memories (or files), which, belonging to different themes, are easily remembered and have always been clearly conscious. The deeper we go the more difficult it becomes for the emerging memories to be recognized, till near the nucleus we come upon memories which the patient disavows even in reproducing them. We have said that this material behaves like a foreign body, and that the treatment, too, works like the removal of a foreign body from the living tissue. We are now in a position to see where this comparison fails. A foreign body does not enter into any relation with the layers of tissue that surround it, although it modifies them and necessitates a reactive inflammation in them. Our pathogenic psychical group, on the other hand, does not admit of being cleanly extirpated from the ego. The theory of trauma was a crypto-geological hybrid from the very start. Darwin and the geologists had already established that the entire surface of the earth and everything that crawls upon it is a living fossil record, a memory bank rigorously laid down over unimaginable aeons and sealed against introspection; churned and reprocessed through its own material, but a horrifying read when the encryption is broken, its tales would unfold in parallel with Freud’s, like two intertwining themes of humiliation. Abandoning the circumspection with which Freud handles what he still supposes to be ‘metaphorical’ stratal imagery, Dr Daniel Barker’s Cosmic Theory of Geotrauma, or Plutonics, flattens the theory of psychic trauma onto geophysics, with psychic experience becoming an encrypted geological report, the repercussion of a primal Hadean trauma in the material unconscious of Planet Earth. Further developing Professor Challenger’s model of ‘generalised stratification’, Barker ultra-radicalises Nietzschean genealogy into a materialist cryptoscience. Who does the Earth think it is? It’s a matter of consistency. 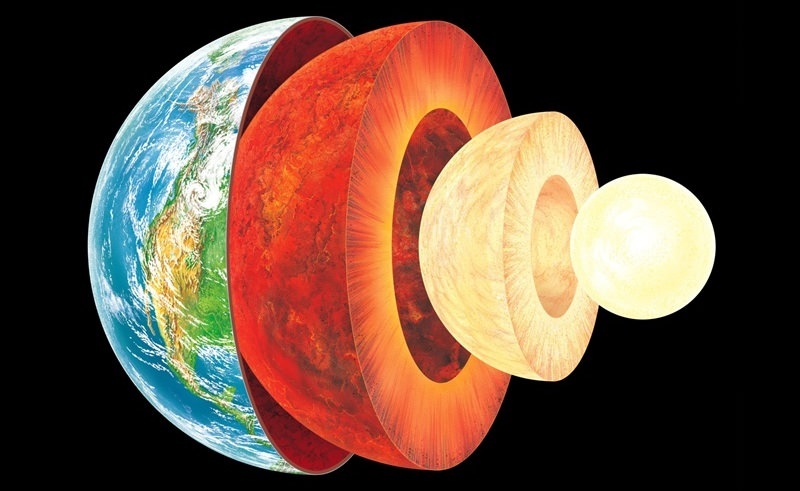 Start with the scientific story, which goes like this: between four point five and four billion years ago – during the Hadean epoch – the earth was kept in a state of superheated molten slag, through the conversion of planetesimal and meteoritic impacts into temperature increase (kinetic to thermic energy). As the solar system condensed, the rate and magnitude of collisions steadily declined, and the terrestrial surface cooled, due to the radiation of heat into space, reinforced by the beginnings of the hydrocycle. During the ensuing – Archaen – epoch the molten core was buried within a crustal shell, producing an insulated reservoir of primal exogeneous trauma, the geocosmic motor of terrestrial transmutation. And that’s it. That’s plutonics, or neoplutonism. It’s all there: anorganic memory, plutonic looping of external collisions into interior content, impersonal trauma as drive-mechanism. The descent into the body of the earth corresponds to a regression through geocosmic time. Trauma is a body. Ultimately – at its pole of maximum disequilibrium – it’s an iron thing. At MVU they call it Cthelll: the interior third of terrestrial mass, semifluid metallic ocean, megamolecule, and pressure-cooker beyond imagination. It’s hotter than the surface off the sun down there, three thousand clicks below the crust, and all that thermic energy is sheer impersonal nonsubjective memory of the outside, running the plate-tectonic machinery of the planet via the conductive and convective dynamics of silicate magma flux, bathing the whole system in electromagnetic fields as it tidally pulses to the orbit of the moon. At the birth of the solar system, deviating from the protoplan¬etary disk that is to become the central body, a tiny, uniform spher¬ical mass emerges from the solar nebula. Within 500 million years, a sudden sinking of matter into a dense metallic core – the ‘Iron Catastrophe’ – precipitates the formation of a differentiated, layered plan¬etary structure, its molten inner matter surrounded by a thin rocky mantle and cold crust. This brittle surface seals into the depths the repressed secret of Earth’s ‘burning immanence with the sun’. But the face of Earth does not remain still. The shifting visage of the planet results from the combination of external processes – climatic denudation and deposition – and internal processes – the movement of igneous or magmatic fluids. These two groups of processes transform the surface of the earth and shape the destiny of everything upon it. Their energy sources are, respectively, the sun, and its repressed runt sibling, the inner core of the earth. Thus, the thin crust destined to shield the inhabitants of Earth from its primal trauma, wears on its face the continually-shifting expression of the helio-plutonic bond. Periodically, the pressure of magma in depth impels it to move in the direction of least resistance: repressed energy erupts onto the surface, forming igneous intrusions through the crustal rocks. The terrestrial symptoms that crystallise around these periodic outbreaks of plutonic catharsis are far-reaching and ramified. Resident Alien; The Insider. Trauma is at once a twisted plot, a geological complex, and a heavily-encrypted file-system. The archives come to the surface only to be churned and folded back into the detritus of their own repression. The tendrils of the ‘pathogenic nucleus’ merge imperceptibly with ‘normal tissue’. And every living individual that ever existed is a playback copy, drawn from the recording vaults, trapped in a refrain that sings the glory of Cthelll. Beyond the restricted biocentric model outlined in Beyond the Pleasure Principle, Barker’s theory extends trauma to encompass the inorganic domain. The accretion of the earth is the aboriginal trauma whose scars are encrypted in/as terrestrial matter, instituting a register of unconscious pain coextensive with the domain of stratified materiality as such. It is not known whether Barker was ever in direct contact with Dr. Bodkin, although the latter developed his work while serving on the covert research mission that preceded ‘Project Scar’. In any case, among the features their theoretical works share is a reworking, through this radicalised Freudian theory of trauma, of the discredited biological notion that ‘ontogeny recapitulates phylogeny’. If the biological is but a tortured incantation of Cthelll’s seething inner core, genealogy, stratoanalysis and information theory promise a cryptography of this cosmic pain; and Haeckel’s recapitulation thesis provides a suggestion for how an hysterico-biological filing-system might be formatted. Needless to say, trauma belongs to a time beyond personal memory – Evidently, Geotraumatics radicalizes Professor Challenger’s insistence that schizoanalysis should extend further than the terrain of familial drama, to invest the social and political realms; pushing beyond history and biology, it incorporates the geological and the cosmological within the purview of a transcendental unconscious. The root source of the disturbance which the organism identifies according to its parochial frame of reference – mummy-daddy – or which it construes in terms of the threat of individual death, is a more profound trauma rooted in physical reality itself. Trauma is not personal, and the time of the earth is recorded, accreted, knotted up inside us. All human experience is an encrypted message from Cthelll to the cosmos, the scream of the earth. Nietzsche suggested that the structure and usage of the human body is the root source of the system of neurotic afflictions co-extensive with human existence; but this is also a planetary neurosis. Geotraumatic cryptography must proceed as ultra-genealogy, accessing these memories deep-frozen and imprinted in the body and determining the planetary events which they index. Vertigo’s dramatization of hysteria may seem to linearise Freud’s topologically-twisted model, suggesting that the core may be reached, repetition escaped, through linear regression, through an accessing of personal memory, a peeling back of layers. Perhaps it is only the exigencies of visual entertainment that take it off the couch, outside the therapist’s office; but it intuits the kinship of the system of hysteria with non-human systems of memory; and (very possibly Hitchcock was reading Bodkin as well as Freud) it sees traumatic regression activated not through introspection but through return to a former environment, with the unconscious tacked onto geography in the form of affect-triggers. Tall trees. Hence we return to Haeckel’s recapitulation thesis. In his formulation of ‘neuronics’, Bodkin sought to understand the unconscious as a time-coded spinal memory, a series of evolutionary chemical-response triggers sensitive to climatic conditions. Neuronics sets out to empirically map the relation between psychic organization, biological phylogenesis, and environmental stimuli. Bodkin’s disconcertingly prescient theory discusses the prospect of an inundation of the planet, during a runaway climatic shift, causing tropical heat and oceanic expansion. His experiments chart the resulting modifications of the unconscious, as climate change triggers the shutting-down or reawakening of behaviours belonging to prior evolutionary stages of the human. Notwithstanding the ‘discredit’ of Haeckel’s thesis – that ontogeny recapitulates phylogeny, that every individual being, in its development, reiterates the stages of evolution of its remote ancestors – like Barker, Bodkin discerns a theoretical potency beneath the linear simplicity that allows its easy dismissal. If major evolutionary changes are the result of catastrophic shifts in the planetary environment – the onset of ice ages, changes in the atmosphere, the parting of tectonic plates, significant rises in temperature – then the biological can be understood, in geotraumatic terms, as a map of geological time. The issue here – as always – is real and effective regression. It is not a matter of representational psychology. Haeckel’s […] Recapitulation Thesis […] is a theory compromised by its organicism, but its wholesale rejection was an overreaction. [Bodkin’s] response is more productive and balanced, treating DNA as a transorganic memory-bank and the spine as a fossil record, without rigid onto-phylogenic correspondence. What am I suggesting? That Homo sapiens is about to transform himself into Cro-Magnon and Java Man, and ultimately into Sinanthropus? No, a biological process is not completely reversible. If infantilism were all the past had to offer, then psychoanalysis would be time-travel, and the future would be well-balanced. Announcing themselves as hyper-Freudianism, Neuronics and the Cosmic theory of Geotrauma shift from the imaginary familial circuit to the lagoons of deep time. They introduce diagonalised matter-memory in order to study the twisted indexing of the Geo-Archaeo-Psychic. For Barker, therefore, as for Bodkin, the schizoanalytic ‘treatment’ of geotrauma, the discovery of the ‘innate releasing mechanisms’, is a matter of ‘real and effective regression’, which can only be carried out on an experimental and empirical basis, on the basis of a certain hypothesis concerning the relation between time, matter and trauma. A noteworthy outcome of this hypothesis is a certain deepening of pessimism: Ultimately, nothing short of the complete liquidation of biological order and the dissolution of physical structure can suffice to discharge the aboriginal trauma that mars terrestrial existence. A collective becoming-snake of human civilization would be only the first step. When, in the 1990s, the Cybernetic Culture Research Unit – probably, it is thought, through the agency of the aged Anatole Alasca, once assistant to Professor Challenger – disinterred the by then all-but-hermetic Daniel Barker from his lab at MVU for that last CCRU interview, Nick Land embarked upon his shortlived revival of the Geocosmic Theory of Trauma through a series of experiments in microcultural destratification, documentation of which has recently been rediscovered. Land was a relay, keeping the signal alive, but of course he didn’t last long, he burnt out just like Barker before him. In 99-2000 Parsani joined us, but he was too far gone to be of any help. That’s why the Committee needed a new candidate. So where is ‘Negarestani’ supposed to go with this? He begins by elaborating on the story so far: the conspiracy to return Cthelll, the earth’s core, repressed runt sibling of the sun, to immanence with its solar mothership; the plotting of the return of the Tellurian insider; and the agency of oil as tellurian lube. All this we know and approve of. But what is important is this: Ultimately, a theory that locates the source of the ills of the human psyche in the accretion of the earth 4.5 billion years ago is – obviously – far too parochial for the purposes of the Committee. It owes its local inhibitions to Land’s fondness for Bataille and his disproportionate attention to Freud’s later, flawed model of trauma in Beyond the Pleasure Principle. According to Bataille’s ‘solar economy’, the most basic economic problem is not scarcity but the exorbitant excess of solar energy; all movements on this planet, from the basest physical processes through to the highest sophistications of life and culture, consist only in labyrinthine detours of one and the same vector – the profligate expenditure of energy by the sun. The secret of all apparently stable and economically conservative being is that it is already pledged to solar abolition, it already belongs to the sun and its radical horizon of death. Negarestani recognizes the just alignment of Bataille’s notion of the Solar Economy with Freud’s speculative thesis concerning the nature of organic life: According to ‘Beyond the Pleasure Principle’, the preservation of a lifeform in relation to the excessive energy source it draws upon, demands the sacrifice of a part of that lifeform: the creation of a mortified outer surface or crust – ‘a special envelope or membrane resistant to stimuli’ – that protects it from its exorbitant source of energy. Thus, the survival and individuality of an organic lifeform, biological, psychic or cultural, is based on the repression of an originary trauma in which it encountered, in all its naked power, the source of energy that would also be its death. Lifeforms are lagoons, repressed pockets of forgetting, temporarily protecting themselves against the outside that created them and will destroy them. Thus we can say that all forms of life are solutions to the same problem; managing the excoriating excess of solar energy which will eventually consume them in death. As modes of life become more complex and more numerous, their dependence upon the excessive power source only grows stronger; as Negarestani argues, there is a mutually-reinforcing symmetry between the plurality of life and the monism of death. Another way to put this is that, from the point of view of the securitised individuated lifeform closed up against its traumatic encounter with solar excess, the sun inevitably becomes the single and absolute horizon or vanishing point for all life. This development of what Negarestani will call the ‘monogamous model’ of the relation between terrestrial life and the sun, is relayed in the cultural and economic forms of capitalism. Capitalism appears as a crazed thanatropic machine, unlocking the earth’s resources – in particular, the fossil fuels that were, in more optimistic times, referred to as ‘buried sunlight’ – to release them to their destiny of dissolution, and thus accelerating the consumption of the earth by the sun. Mankind is the first lifeform to contemporaneously communicate with geological time; a gigantic volcano, a holocaust of consumption, a fault in the file-system. Yet this unbridled consumption also manifests itself culturally in an ever-increasing complexification and elaboration of multiple ‘ways of life’ and supposedly infinite possibilities and differentiation. To break thought out of its capture by the monogamous model, even though the propaganda of the solar empire runs through the entirety of biological life and human culture – including the flawed variants of geotrauma theory. This is Negarestani’s first mission – To broaden still further the theory in rescinding the status of the sun as sole ‘image of exteriority’, as ultimate singular horizon for all life. The sun is not the absolute or the abyss, but only a local blockage, a restriction, a blind spot that obscures the opening of the earth onto a more general cosmic economy which produced it and which will consume it, along with the sun. And therefore, the terrestrial plots that play out in the human psyche must be traced back beyond the paltry 4.5 million year lifespan of the planet. The trauma is deeper still, and more weird, than Challenger, Barker or Land had imagined. To contemplate these icy, inevitable vistas of cosmic time is in a certain sense already to go beyond geotrauma. The viewpoint of an ecology radical enough to take in these extra-solar eschatologies not only breaks through terrestrial concerns, but also through the ‘solar horizon’ that has governed our thought on and of the earth. As Negarestani will say, ‘to be truly terrestrial is not the same as being superficial’. To be truly terrestrial is to embrace the perishability of the earth, and its implication in the universe, beyond the local economics of the relation between the sun and the surface; to replace the monogamous relation between a contingent earth and the necessary and absolute sun around which its planetary path winds, with a relation of multiplicity between this planetary body and the cosmic contingencies which led to its formation, a cosmic chemical conspiracy that works through the earth, and which finds its dissolute destiny beyond the sun. Chemophilosophy; geotrauma unearthed. The ‘Speculative Realist’ racket provided a perfect opportunity; capitalizing on the vogue for imagining one can subtract theoretical thought from the human imaginary, from narrative and from sense, through Negarestani we are able to inject it, precisely, with the narrative element that is, as paradoxical as it may seem, an integral part of the procedure. Signification cannot be crushed without following plots that tell ever-new stories of the earth. It’s not a matter of using science or a new metaphysics to eradicate such tales, but of constructing a science of real plots, which is what Geotrauma – in Negarestani’s hands – becomes. The compulsive-repetitive symptoms that are human culture cannot be overcome simply by precipitately stripping them down to a reductive physical, metaphysical or relational states. The instigation of a collective schizoanalysis must proceed through the development of the experimental means for ‘real, effective regression’, for meticulous decryption. it is quite hopeless to try to penetrate directly to the nucleus of the pathogenic organization. […] We ourselves undertake the opening up of inner strata, advancing radially, whereas the patient looks after the peripheral extension of the work. Unpick the individual, travel down her spine, into the rocks, through the iron core, attaining a burning immanence with the sun, and exiting towards the unknown. Ferenczi’s traumata are plotholes that must be plumbed, outward itineraries that must be travelled. The time of trauma is altered. Geophilosophy was always a chemophilosophy: just as it needed to explode the constricted and escape to the political surface of the earth, and just as it was then necessary to understand the apparently stable surface as an arrested flow and to penetrate to the depths, the cosmic theory of geotrauma now needed to pass through the core of the earth only to escape its inhibited mode of traumatic stratification and to carry its interrogation further afield, or rather according to a new mode of distribution. The Committee’s question is: which practices, conspiracies, theories, insurgencies, setting out from the local surface, will ‘assist the earth in hatching its inner black egg’; which plots will assist in decrypting the addresses of traumatic agents no longer understood as foreign bodies that assault the protective membrane of the organic individual, nor even as a repressed fragments of a greater exuberance; but as xeno-chemical insiders, Old Ones waiting to be awakened. What stimuli will key into the triggers that will attach us to a Kurtz-gradient, disintricating the tangled themes that surface as reality-symptoms, allowing us egress into dreams where the lagoon of personal memory drains into a sea of cosmic trauma? Guided by his dreams, he was moving backwards through the emergent past, through a succession of ever stranger landscapes, centred upon the lagoon, each of which seemed to represent one of his own spinal levels. At times the circle of water was spectral and vibrant, at others slack and murky, the shore apparently formed of shale, like the dull metallic skin of a reptile. Yet again the soft beaches would glow invitingly with a glossy carmine sheen, the sky warm and limpid, the emptiness of the long stretches of sand total and absolute, filling him with an exquisite and tender anguish. It’s a question of writing, but also of mapping. That’s where Cane comes in. Once you see the Atlas you’ll know where to go. The Plutonics Committee had to exert some pressure, to get things moving. There is nothing for it but to keep at first to the periphery of the psychical structure. We begin by getting the patient to tell us what he knows and remembers, while we are at the same time already directing his attention and overcoming his slighter resistances by the use of the pressure procedure. Whenever we have opened a new path by thus pressing on his forehead, we may expect him to advance some distance without fresh resistance. It therefore remains for us to see how, effectively, simultaneously, these various tasks of schizoanalysis proceed. It was over. Only later would all of this take on concrete meaning. The double-articulated mask had come undone, and so had the gloves and tunic, from which liquids escaped. Disarticulated, deterriorialized, Negarestani muttered that he was taking the earth with him. See F. C. Adams ‘Long-term astrophysical processes’, in N. Bostrom, M. M. Cirkovic (eds.) Global Catastrophic Risks (Oxford: Oxford University Press, 2008). Reza Negarestani, On the Revolutionary Earth.